Meet Joie’s most compact stroller ever: the Joie Pact Lite Stroller. This clever stroller folds into a tiny bundle perfect for popping in smaller boots or tucking into tight storage spaces. Almost as light as it is compact, the Joie Pact Lite Stroller has a simple one-hand fold and a nifty carry strap, so you can pack up in a second. Freestanding when folded, this compact chariot is easy to guide, with an adaptable handle that adjusts from 97 to 107cm high. The Joie Pact Lite Stroller has your little one’s comfort in mind too. The forward-facing seat reclines all the way from upright to a lie- flat position suitable for newborns, and to some very comfy nap-angles in between. The leg support adjusts to 2 different positions, so your little one can travel in comfort. This stroller is equipped with a SoftTouch 5-point safety harness with chest pads to keep baby snug and secure as you stroll. SweetStride wheels offer an adaptable ride when on rougher terrain, combining manoeuvrabilitywith smooth rolling action. All-wheel suspension lets your little one nap away even when the going gets bumpy. The single-step ShoeSaver brake is designed to keep shoes scuff-free, for low-wear braking. 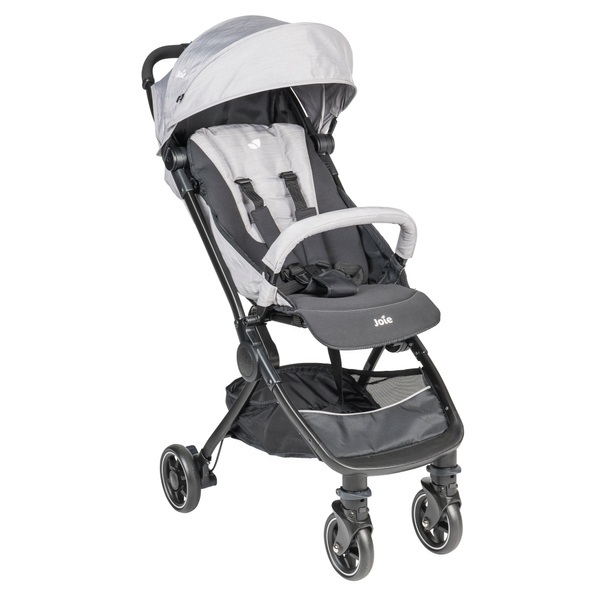 The Joie Pact Lite Stroller features an extendable UPF 50+ canopy with a sun visor to shade your child and comes with a raincover for shelter on wet days.